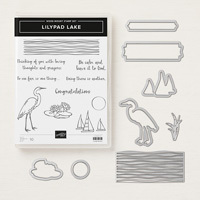 Lilypad Lake Clear-Mount Bundle by Stampin' Up! 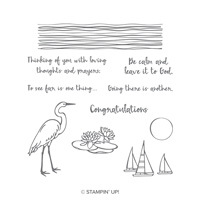 Serene sentiments for sending out calm vibes to your loved ones. 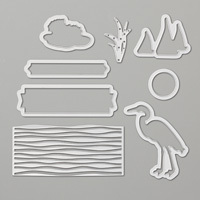 Create beautiful die-cut lakeside sceneries in record time with Framelits dies and the Big Shot. Run the wave Framelit through your Big Shot several times to create a full card front texture piece. Waves can also easily be trimmed for variable height.